For those in the U.K. it needs no explanation but for everyone else it should be said that we here in this green and pleasant land are enjoying even more greenness than usual. This is because for the 6th year in a row we are enduring a washout summer. With April and June being the wettest of their respective months ever and surely July heading the same way as week after week different areas are subjected to a months worth of rain in 24 hours. Much of the country is in floods, some repeatedly so with houses evacuated, crops ruined and lives lost. The news last night was largely taken up by weather related stories and the weather forecast today is for heavy rain and more floods so it was with some shock that after the weather on Channel 5 that the same presenter reappeared in front of a rainy map of Britain to give us news on the UV index all sponsored by a sun screen cream. Despite all this rain and the weather map itself being covered in dark clouds and rain with a UV Index somewhat optimistically set at 1 over the whole country, the presenter then urged people not to go outdoors in the sun between midday and 3pm unless they have to and if they do then they should cover up and splash on the sun cream. I don’t watch a lot of Channel 5 and thought I was mishearing when I came across this a week ago during more floods but was still suitably gobsmacked on hearing this. I know television channels have to make money but isn’t his just taking the biscuit. I would also urge people not to go out between midday and 3pm because you will get soaked and if you do have to go out cover up with a rain coat and umbrella. 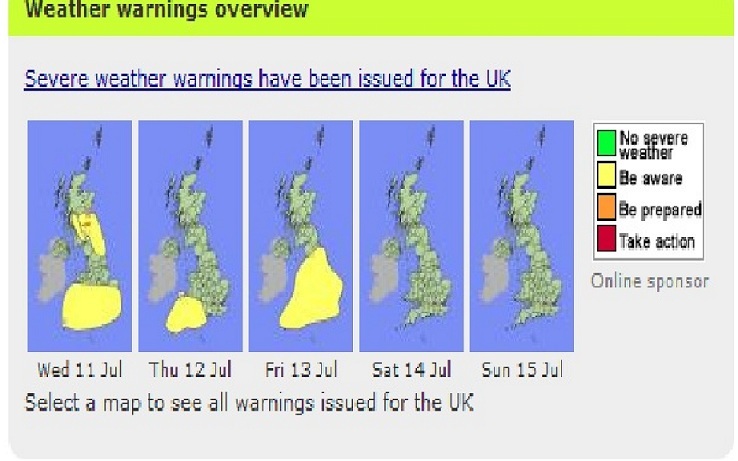 And just to show up how silly this TV segment was, below is the official Met Office warning for the next few days. Everywhere will get rain and everywhere in yellow should keep their canoes handy. Get that sun cream ready!!! This entry was posted in Funny & Humour, television and tagged Weather. Bookmark the permalink. I live in the Seattle, Washington area of the USA, and I can sympathize with your weather woes. Most of our country has been having terribly hot weather, some areas losing power for days while enduring temperatures over one hundred degrees. We have been running mostly in the seventies, although this month has been better. I would rather have the rain than the extreme heat and drought or the flood conditions your country is experiencing. Hope things change for you soon. Yes I have seen the drought and wild-fires on the news for your country. It seems the jet stream has gone wrong and both sides of the Atlantic are suffering extremes rather than enjoying more normal seasonal weather. We have been told that starting from today our weather will move into the seventies and maybe eighties in a weeks time which would be most welcome for a few weeks. I did go for a walk at work yesterday lunchtime with no jacket on for the first time since early May so hopefully change is coming. I hope the extreme heat moves away from your country too.